Michigan State University's biometrics team modified their human facial recognition system to create LemurFaceID, the first computer facial recognition system for lemurs. Once optimized, LemurFaceID can assist with long-term research of endangered species. Credit: Stacey Tecot, University of Arizona. Facial recognition is a biometric system that identifies or verifies a person from a digital image. It's used to find criminals, identify passport and driver's license fraud, and catch shoplifters. 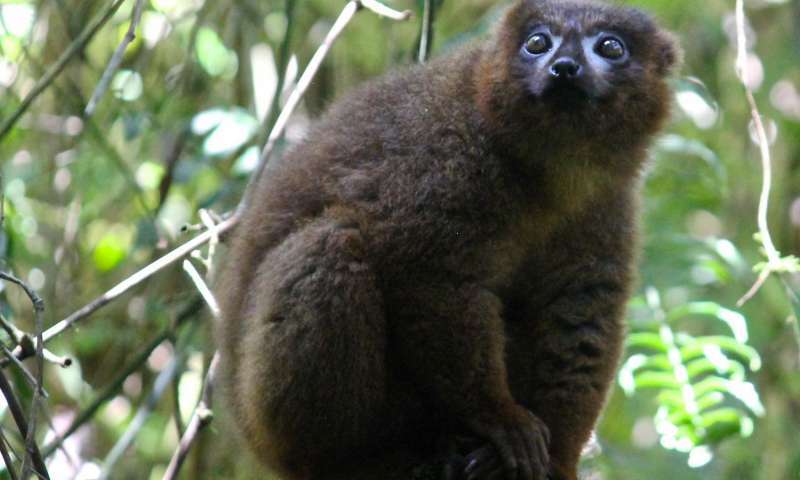 But can it be used to identify endangered lemurs in the jungles of Madagascar? Yes, said Anil Jain, biometrics expert and university distinguished professor at Michigan State University. "Like humans, lemurs have unique facial characteristics that can be recognized by this system," Jain said. "Once optimized, LemurFaceID can assist with long-term research of endangered species by providing a rapid, cost-effective and accurate method for identification." Jain used 462 images of 80 red-bellied lemurs and 190 images of other lemur species to create the dataset for the facial recognition system. Many of the photos were taken in Ranomafana National Park in Madagascar by study co-authors Rachel Jacobs of George Washington University, and Stacey Tecot of University of Arizona. For short-term studies of lemurs, researchers often rely on "soft" identifiers to recognize individual lemurs, such as differences in body size and shape or the presence of injuries and scars. However, relying on variations in appearance can make it difficult for different researchers studying lemurs to identify the same lemur over time. This means there are few long-term studies of lemur populations. "Studying lemur individuals and populations over long periods of time provides crucial data on how long individuals live in the wild, how frequently they reproduce, as well as rates of infant and juvenile mortality and ultimately population growth and decline," Tecot said. "Using LemurFaceID can inform conservation strategies for lemurs, a highly endangered group of mammals." LemurFaceID also provides a more humane, noninvasive way to identify lemurs. "Capture and collar" methods are commonly used to identify wild lemurs but these methods can cause injury or stress and are costly because of veterinary services and anesthesia. LemurFaceID also may be used to assist in other forms of animal conservation. Lemurs, among many other endangered animals, are illegally captured and kept as pets. LemurFaceID could provide law enforcement, tourists and researchers with a tool to rapidly report sightings and identify captive lemurs, which would help with conservation efforts. In addition, Jain believes LemurFaceID can be used to identify other primate and non-primate species with variable facial hair and skin patterns, such as bears, red pandas, raccoons or sloths. Doing so may assist conservation of the world's primates, half of which are facing extinction. "Facial recognition technology has the potential to help safeguard our society," Jain said. "Adapting it to help save endangered species is one of its most inspiring uses." This paper was published recently in the journal BMC Zoology.